Fast-food workers in New York City are expected to walk off their jobs Thursday, one year after their first strike, joining a 100-city strike wave. Organizers say actions will take place all across the country as part of the movement for $15 an hour and the right to form a union without retaliation. In New York City, there are more than 57,000 fast-food workers, and the median wage is $8.89/hour, the lowest of any occupation in the city. With support from union groups such as the Service Employees International Union, the fast-food protests have dramatically grown over the course of the last year. The early protests in New York City in November grew to thousands of protesters waging actions in seven other cities during the summer. An August strike spread to more than fifty cities, including areas in the South that have historically been hostile to union actions. This Thursday, there will be more new strike locations in Charleston, South Carolina; Providence, Rhode Island; and Pittsburgh, Pennsylvania. Mary Coleman, known to her co-workers as Ms. Mary, works at a Popeye’s in Milwaukee for $7.25 an hour. Coleman, 59, lives with her daughter, who has a heart condition, and her two grandchildren. She also relies on food stamps to make ends meet and says she would gladly trade in her Qwest card for higher wages. Thursday marks Mary’s fourth strike. Previously, she walked off the job on May 15, August 1 and August 29. Little amenities many individuals take for granted, such as deodorant, are unaffordable for Coleman on fast-food low wages. Coleman says she is inspired by the organizing of low-wage workers in other states. “I’m very excited about it, and it lets me know people can come together and do what’s right,” she says. 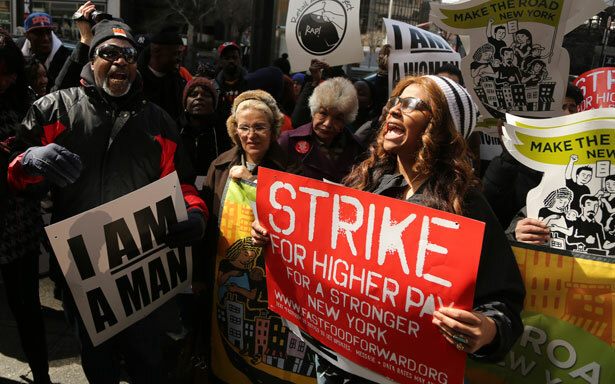 Some workers Coleman’s age might consider protesting a job for younger people, but she felt compelled to join the strikes, if only to show apathetic youth that change is possible. Danielle has worked at Bojangles for four years, started as a cashier and is now a manager making $11 an hour, and though she makes more than entry-level position workers, she still can’t survive on her wages. Over the past year, Danielle’s mother, father, and grandmother have all passed away, so she is now struggling to support herself. She walks five miles every day to work, and because she’s on her own, says she has trouble paying her bills on time. Sometimes she receives her paycheck and sees it isn’t even enough to cover rent. “I’m tired of living paycheck to paycheck. I can’t live like that,” says Danielle. Like many fast-food workers, Danielle says she isn’t scheduled for enough hours, but works hard while she’s at the restaurant, and yet she isn’t fairly compensated for her labor. However, she too draws inspiration from the wave of strikes and walkouts occurring at major big-box stores and fast-food chains all across the country. “It makes me feel good because people are opening their mouths and going on strike, and saying we want a raise. We’ve been busting out butts and we finally want a raise. I’m glad to be one of the people going on strike because this is ridiculous,” she says. Danielle adds she doesn’t fear retaliation from her employers for going on strike. Brooklyn KFC worker Naquasia LeGrand, 22, will be going on strike for the fifth time this week. While she doesn’t have children, LeGrand does have an extended family that she helps support, and even though at $7.70/hour she earns slightly above New York’s minimum wage ($7.25), LeGrand says the fifteen-hours-per-week cap at KFC makes it impossible to earn a living wage. “I have to pay for my Metro card, I have to pay $100 for my phone bill, I do try to put food in the house…. Sometimes I can’t even feed myself,” says LeGrand, who has been working at KFC for two years. The lack of resources finally drove LeGrand to participate in her first strike: “I realized that we needed a change. I thought about the future. Are we going to be living off $7.25 in twenty years?” she asks. LeGrand says she feels under-appreciated by an industry that makes lavish profits off the hard labor of workers like herself. To the naysayers and critics, who say fast-food jobs are low skill, and therefore deserve low pay, LeGrand says these businesses could not profit without workers. LeGrand has participated in the fast-food strikes since they began in November, and hers is a unique perspective, since she’s witnessed the movement grow and flourish, an evolution that mirrors her own transition from skeptic to passionate activist. Last week, Allison Kilkenny reported on the nationwide Black Friday protests against Walmart.